Initially uncertain of her college aspirations and commitment, today Monica Smith – a double major in German and Mechanical Engineering – is the picture of a successful engineer-to-be. After graduating from E.O. Smith High School, Mansfield, CT in 2007, Monica took part in the ACES program at UConn for her freshman year. She then chose to spend her sophomore year abroad in Germany at the University of Stuttgart through one of UConn’s many tuition-exchange programs. “I knew [since high school] that I wanted to do something in German,” she says. Monica had such a positive experience abroad that she then withdrew from UConn to stay in Germany for another year. Starting in the fall of 2009, she worked as an intern in the procurement department of MTU Aero Engines, Germany’s leading engine manufacturer. This experience with MTU led Monica to believe that engineering was right for her. She returned to UConn for what would have been her senior year and began studying mechanical engineering. Monica didn’t completely leave Germany behind, though – she currently lives in McMahon Hall as an active member and resident assistant of the Eurotech learning community. After a shaky first freshman year at UConn, the School of Engineering turned Monica’s UConn experience around. “The number of faculty in the School of Engineering makes [UConn] feel so much smaller,” she says. “They take really good care of you.” Monica mentions Assistant Dean Marty Wood, as well as Kevin McLaughlin and Sonya Renfro of the Engineering Diversity Program, as being especially helpful to her. Monica also credits many of the programs within the School of Engineering as being helpful to her throughout her post-Germany years at UConn. She’s the co-president of UConn Engineering Ambassadors, which she calls her “support group” within the School of Engineering. “[Engineering Ambassador’s] mission is to promote engineering to younger people… and inspire [students,] especially women and other underrepresented populations to pursue engineering as a career,” says Monica. Now in its second year, UConn’s Engineering Ambassadors reached out to over 3,000 students last semester through day-long visits to schools around the state by Engineering Ambassador’s Presentation Team, of which Monica is also a member. Members of the Presentation Team receive special training on communication and presentation at a weekend workshop in the fall. Through her work with the Presentation Team, Monica was eligible for a United Technologies Corporation Ambassador internship. 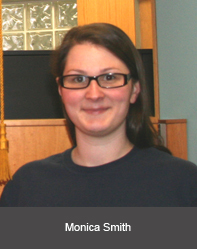 She was placed in the Engineering and Integrative Solutions Group and worked with them through the summer of 2012. Within that group, Monica discovered her interest in additive manufacturing and 3D printing. “I’m 99.9% sure when I graduate that I’d like to work in a 3D printing group,” she says. “After my internship this summer, I went back to [Engineering Ambassadors] and I was like, ‘We have to bring this to kids.’” She then worked with Engineering Ambassadors to purchase two tabletop 3D printers and created an entirely new program within the Presentation Team to demonstrate 3D printing to students around the state. She also started a 3D printing club for 7th and 8th graders at the Academy of Aerospace and Engineering in Bloomfield, CT.
She further explored this interest in 3D printing during an internship on the UConn campus last semester that allowed her to research electron beam melting, another type of 3D printing. Monica is currently continuing her research through a part-time co-op with Pratt & Whitney. This summer, she will intern with them again and start research in propulsion system analysis. Given her incredible extracurricular record, leadership skills, seemingly endless initiative, warm personality and contagious energy, there’s no doubt that she’ll succeed whatever her aspirations.